Sheds come in all shapes and sizes, so you can create one that suits your purpose rather than settling for something standard. Here, a few common uses for this overlooked outdoor space: Lawn and Garden Center: Stow your lawnmower, wheelbarrow, garden tools, and potting supplies in a convenient, easy-to-access area of your yard. Extra Storage: When you run out of room in the garage, a shed is a useful spot to store bikes, sports equipment, tools, pool supplies, and more. Creative Space: A shed can be transformed into an extra room, such as an art studio or a writer’s room, to practice your hobby in peace and quiet. A pool house not only looks good, but it also is a fantastic place to entertain if you have children, if you plan to have alfresco parties or if elegant outdoor dining is in your future. A pool house is one of those havens that will make your day, almost every day. Adding a pool house means more than simply keeping grassy feet off the Oriental carpet. It is about having the ability to entertain elegantly outside in the afternoon or on a balmy evening under the stars. It is about convenience, just as indoor plumbing and central heating (once considered luxuries) have replaced the outhouse and the open fire. Think about not having to run inside the house to greet your guests, one by one, as they arrive. Think about the advantages when you or one of your guests wants to grab a quick drink or use the bathroom. Even better, imagine yourself enjoying your own party, not wondering if someone is inside your house while you are outside talking with guests. 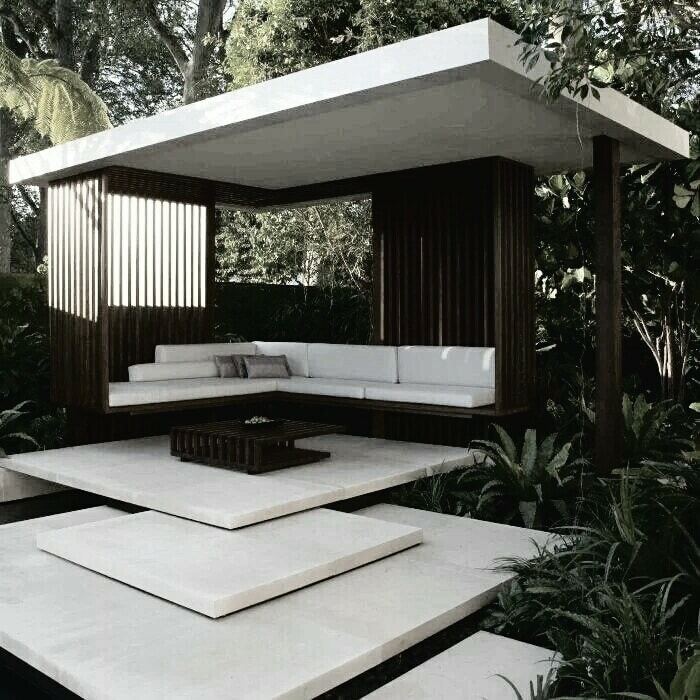 Imagine turning your outdoor space into a personal oasis, an escape from the hectic pace of life. Imagine if that space could instantly transform from a place of solitude to an entertainer’s dream. We developed this Western Red Cedar Gazebo with an elegant mixture of Japanese influence & contemporary functionality including hideaway screens.